Warped Galaxies: So what the heck is orienteering? So what the heck is orienteering? Orienteering is a great sport, and I highly recommend it to any one who likes to be out of doors, who likes to solve problems, and who likes a physical challenge coupled with a mental workout. Describing orienteering is almost as challenging as doing it! Some basic information: orienteering clubs around the world (such as Indiana CrossRoads Orienteering,which is my home club)organize meets in different woods. Some do so on a weekly basis, others on a monthly or bi-weekly basis. Each time you go, the experience is different because you are in a different forest, running different courses. Of course, local clubs will use the same woods from season to season, but often they try to vary the starting points, so that the competitors use a different part of the woods than they did the last time they were there. So, how do you DO orienteering? 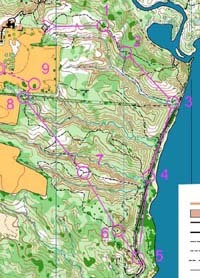 To begin with, you are given a map of the woods with your current location, 8-15 points, and the finish area marked on it, each of which you have to visit in order. It's great fun and a wonderful intellectual challenge while being a good workout. Gets the brain and the body going at the same time. One of the great things about orienteering is that you can do it at many levels of competition. Most local meets offer 3-4 different courses of various levels of difficulty, from the very easy which stays exclusively on trails, to the moderate which will include both trail running and cross country navigation, to the very hard which is almost exclusively off-trail. While some people are extremely competitive, and participate in national and international competition, many participate on a purely recreational basis, taking the course at a leisurly stroll. The easy courses are easy enough for kids to do alone (I started when I was about ten, and my kids participate now.) and the hard courses are real brain game as well as requiring decent fitness. Orienteering can also be done on skis (ski-orienteering is a winter olympic sport), on bikes, in canoes. There are even events for people with limited mobility. Adventure racing often includes an orienteering segment, and for those who like a real challenge, there is the rogaine, a 12-36 hour orienteering event. If this sounds like something you'd be interested in, you can hook up with a local club through the United States Orienteering Federation. In other countries, you can try the International Orienteering Federation.